Much alike the “New” series of Mario games, Nintendo have created another niche micro-genre within their platformers in the “handicrafts” area. 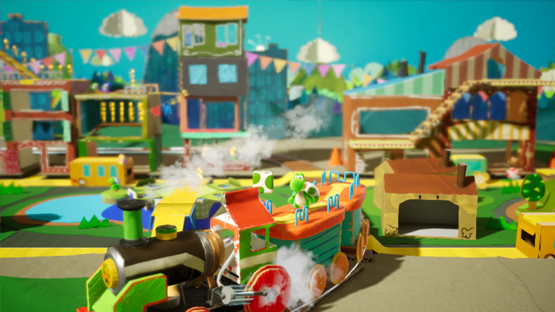 With the latest in this line, Yoshi’s Crafted World, opting for a charmingly childish paper-craft concept this time. 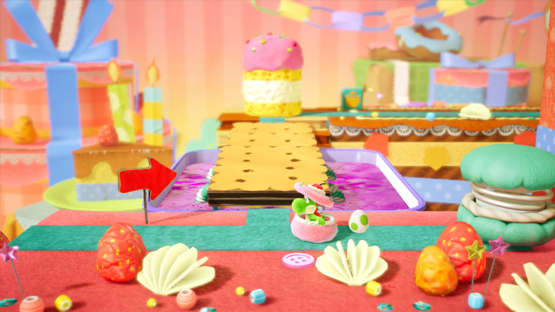 The story of Yoshi’s Crafted World joins a group of Yoshis (Yoshi? Yoshiae? Yoshises?) just enjoying life. Suddenly, owing to the loss of their various coloured gems that power a statue for some reason, they have to head out into the world to try and locate them. Oh, and they need to do this before Bowser Jr. and Kamek get their hands on them too. Before you reach the gems, and the bosses that protect them, you have to make it through the thematic levels of varying difficulty, collecting an incredible array of things in each. 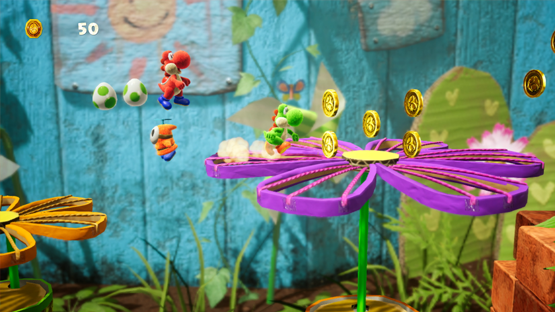 The main focus is the little smiling sunflowers, of which every level has a set amount to collect in level, and bonus ones granted for achieving certain goals. These goals are always set, with the main levels having one each for getting all sunflowers in the level, collecting the 20 hidden red coins, getting a certain number of coins, and finishing the level on full health. As the sunflowers are the main method of progress, you’ll be wanting to hunt through each level finding everything, and some have ingenious hiding places. 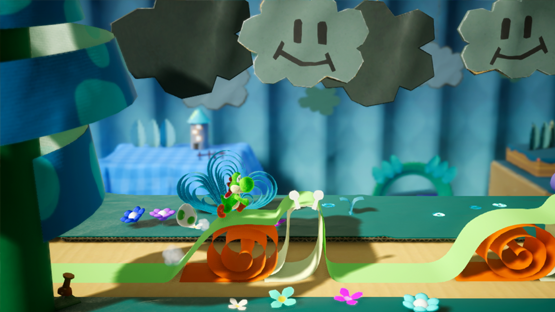 The levels, although playing out in 2D, have a lot going on in both the foreground and background that Yoshi can interact with such as presents and enemies, so you’ll be throwing eggs with reckless abandon (yes, Yoshi’s second best power of pooping eggs is alive and well). You’ll need to look out for opportunities to grab these things because they often disappear quickly. Also, upon completion of each level, you can play them again in reverse, called the “Flipside”. In these versions of the level, you have to find three adorable Poochy pups on your way to the end(?) of the level. You will get sunflowers for getting each pup and finishing the level, so if you’re wanting for a couple of the grinning flora to progress, this is your answer. Finally, in terms of ways to play the levels, are the immensely satisfying scavenger hunts. 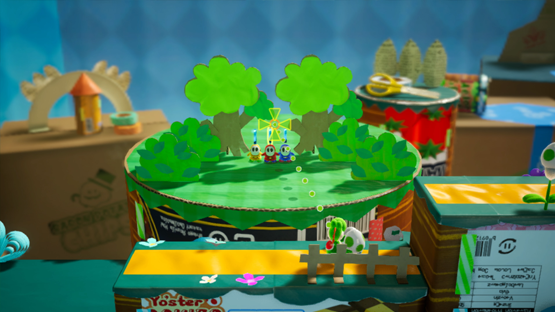 The little odd cardboard robots in the game will occasionally request you bring them some sort of object, or multiple of an object, that can be found in the level. Some of these are fiendish to find, while others will be glaring. Oh, and your prize for finding these is … more sunflowers. The great thing about these hunts is that the game allows you to automatically leave the levels when you find the item, making the experience far less laborious than it could be. This being said, the levels aren’t overly long, allowing for an easier time in dipping in and out of play anyway. This mantra of ease is shared by the ease of co-op play, which is drop in too. 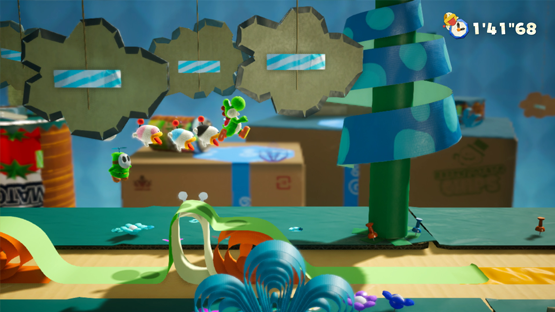 Now, it would be bad of us to not mention the little paper-craft outfits you can get for Yoshi. These are unlocked from gatcha machines throughout the world in exchange for coins and dress up Yoshi in a variety of ways from food packaging to replicas of enemies. Also, these serve the extra purpose of allowing Yoshi to take an extra hit, so they’re not just cute (and they’re VERY cute). 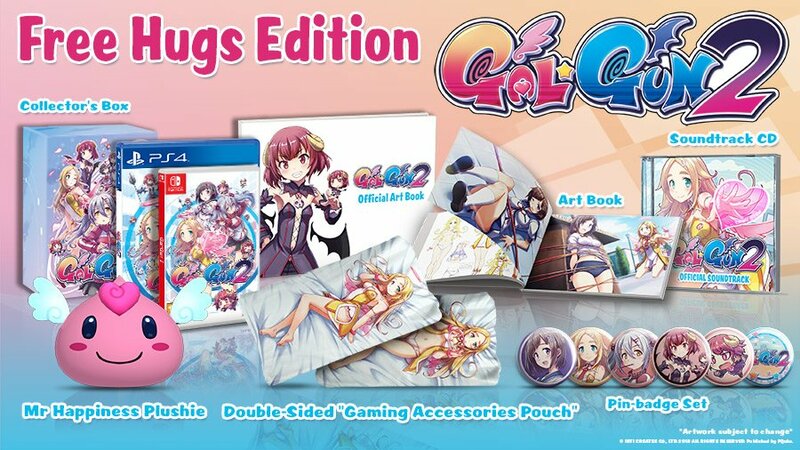 With the huge amount of items in each level, those perky poochy pups running amok everywhere, loads of outfits, and the co-op mode to help/hinder your progress, there’s a lot of game here to see. 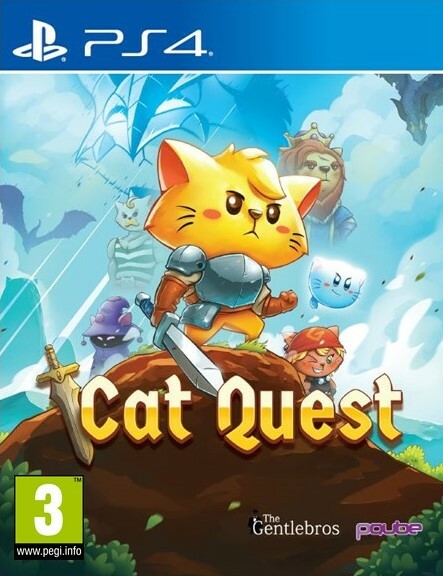 So, despite this being one of the easier of Nintendo’s games, there’s still a fair amount for the average gamer (and completionists) to sink their teeth into. 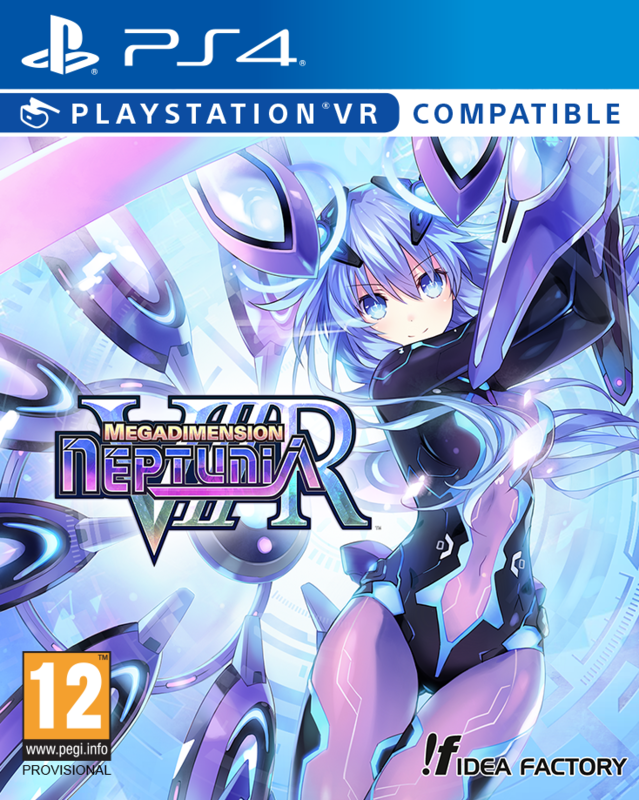 As the final selling point for the game, there is an easy mode to be found which alters the gameplay to allow all ages to play. This, among other things, will allow Yoshi to infinitely fly negating loss of life from falling. Mellow Mode is a great call from Nintendo, revising features to help the intended audience of the game – young children – without alienating older players. The inspiration, and aesthetic, of the game can be found throughout in both large and minute ways. 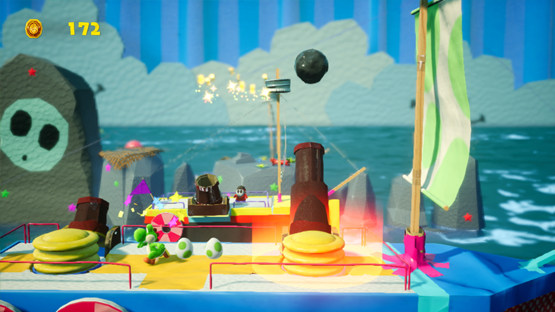 There’s obviously the fact that everyone of the stages is an elaborate papercraft project, but this theme can even be found in the loading screens, featuring those tearable strips from the back of cardboard parcel packaging “opening” each level. As such, the aesthetic of the game is childishly divine. The entire game looks like it could have been made by a group of young children, complete with paper plate fish glittering in the background of the “water” levels and little paper curls that prop up bridges. Everything in the game has been carefully considered to match this concept. The music too, perfectly matches the visuals, with all of the upbeat charm and simplicity you would expect from a game starring everyone’s favourite egg-pooping dinosaur. As such, the music is sadly forgettable out of context, and I couldn’t tell you a favourite at all, but it so seamlessly fits within gameplay that it can be forgiven (mostly). Yoshi’s Crafted World is out this Friday, March 29th, for Nintendo Switch. Have we sold you on the game? Why not pick up a copy?